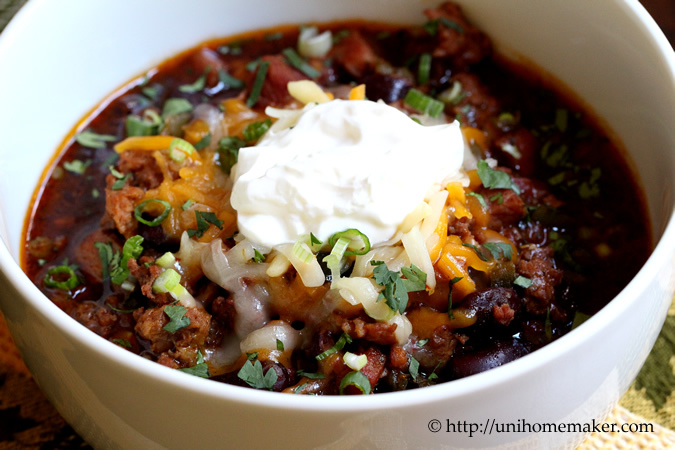 I made this pot of chili before I got sick and am wishing I had some right now! There’s nothing more comforting than a big bowl of something warm and comforting in front of your nose. 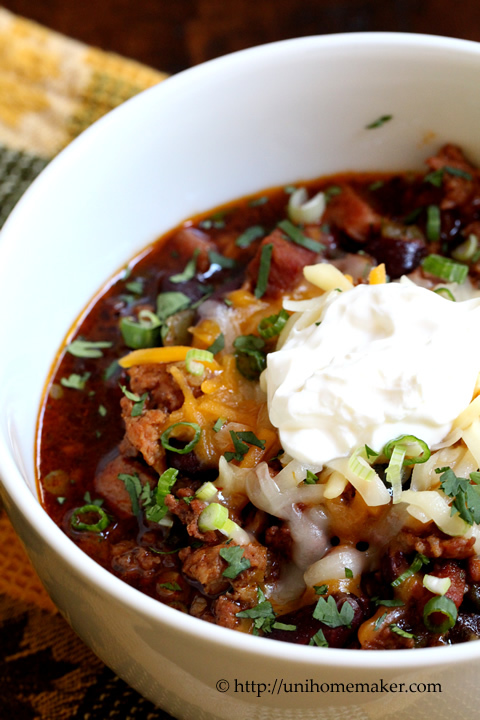 A pumpkin chili is so perfect this time of the year. There’s a lot of pumpkin ingredients going on here — pumpkin ale, pumpkin purée and pumpkin pie spice. It was autumn in a bowl! Be sure to put this one in your dinner rotation this week, if you dig pumpkin and stay warm! In a large Dutch oven over medium high heat add olive oil, ground beef and sausages. Crumble and brown meat. Once cooked, use a slotted spoon to transfer meat into a bowl; set aside. Remove any grease left in the pot, if any. Drizzle olive oil and add onions and garlic. Cook until soften then add ham steak (including bone) and peppers (poblano and jalapeño). Season with salt and pepper. Add tomato paste. Stir it around then add chili powder, smoked paprika, pumpkin pie spice, ground cumin, coriander, dried oregano, bay leaf, diced tomatoes, kidney beans, pumpkin purée and cooked meat. Stir to combine. Then pour the pumpkin ale and scrape the bottom of the pot. Cover and bring to a boil. Reduce the heat to medium low and leave the lid ajar. 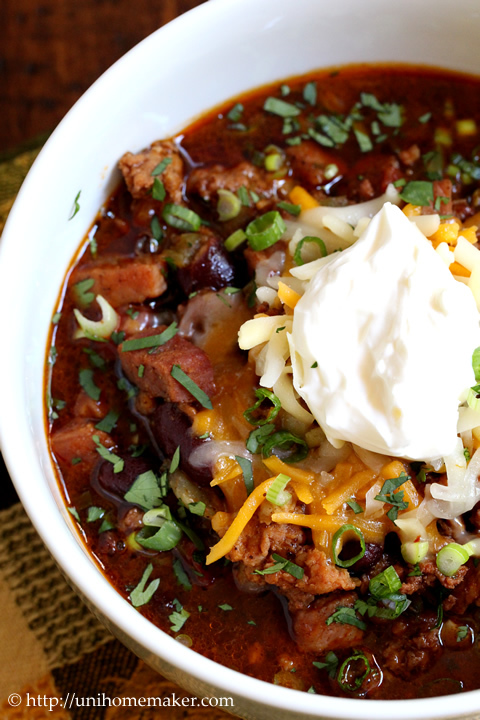 Simmer chili for 30-40 minutes. Discard bay leaf and ham bone. Check for seasoning. 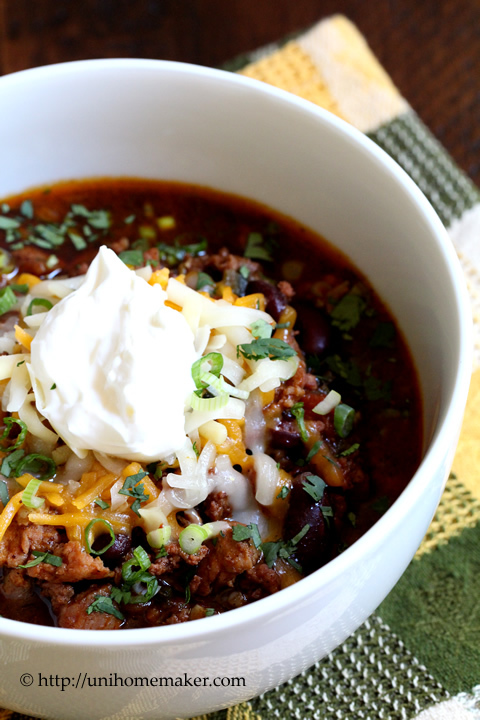 Ladle chili into a bowl and garnish with shredded cheddar cheese, shredded pepper jack cheese, sour cream, chopped scallions and cilantro, if desired. Well, I’m so late reading this post, I guess you’re back on your feet and dancing…lol! 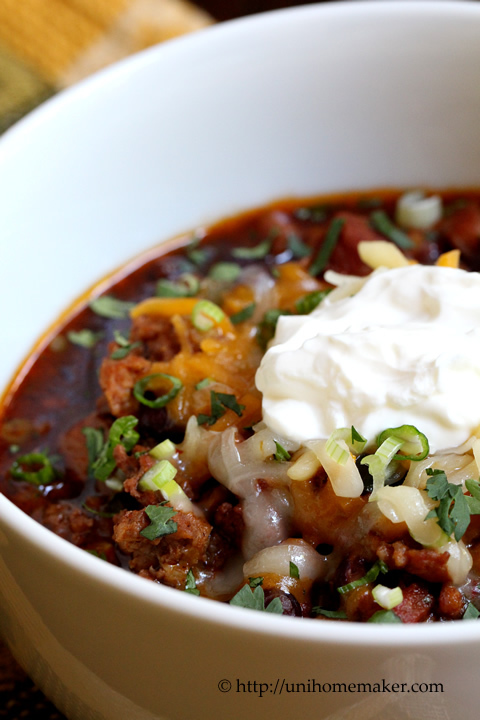 This chili is absolutely perfect! The spring here is quite chilly lately, so I’m craving this type of food. Sorry you were under the weather — I’m sure this big bowl of goodness was comforting! I make pumpkin chili all the time but not usually with meat — I know my family will love this version (house full of dudes = carnivores). The pumpkin ale is also great! Thank you so much for linking up at Saturday Night Fever! !